This news clip covers both the imminent Channel 4 launch (2 November 1982) and the launch of S4C. The main focus is on planned ITN news coverage – and Channel 4′s intention to offer a specialist focus on longer reports, especially in coverage of arts and science. But the news item also features a brief clip of SuperTed, whom it hails as the first star of the new S4C channel, which had already gone live by the time this item aired on 1 November 1982. Channel 4′s Remit – Corporate Channel 4 website area detailing the legal remit under which the channel operates. On 29th March 2011 Nicola, from the Addressing History team, gave a short â€œPecha Kuchaâ€� presentation on AddressingHistory at the LIFE-SHARE Digital Collaboration Colloquium in Sheffield. LIFE-SHARE has been a project looking at digitisation and digital preservation of historical materials across three universities (Leeds, Sheffield and York) and the event focused on sharing experiences and ideas about the ways in which digital materials can be made available and shared with wider communities. The day opened with a welcome from Jacky Hodgson, head of special collections at Sheffield. Then Bo Middleton, Lifeshare project director gave us our mission for the day: each of the six or so tables we were gathered around needed to formulate one good Round Table question. Peter is Head of Special Collections and Archives (SCOLAR) at Cardiff University. One of Peter’s colleagues David Learmount from Bangor can’t make it along today but he has fed into this presentation. WHELF is the Welsh Higher Education Libraries Forum and it combines Higher Education Chief Librarians, the National Library of Wales (NLW) Librarian, and a part-time development officer. The forum meets 4 times a year though there are various subgroups for projects. The group was originally founded in the 1980s and has existed in various forms since. Influence policy makers â€“ there have been lots of policy decision makers on the doorstop since devolution which makes a big difference. Raise profile of Higher Education (HE) libraries work. Enable training, communication and support roles. Information Literacy Wales â€“ this is a major project which the National Assembley’s Museums Archives and Libraries Wales (CyMAL) has substantially funded. E-book deals – although this is about to end and unfortunately it has not been cost effective in terms of what libraries found they were getting from suppliers. E-resource procurement â€“ generally this is at the level of the National Library of Wales which purchases materials to be made available to all of Wales. The policy of NLW is that if you live in Wales (and/or have a Welsh address) then you are a member of their library. You just need to login to access e-resources as well as their own digitised resources. Better student access â€“ for instance WHELF has enabled a common borrowing policy in West Wales so that students at a series of smaller institutions have access to all local collections not just those of their own institution. Welsh Repositories Network (work completed as part of the JISC repositories preservation programme). E-thesis harveting service (NLW) â€“ if that continues then e-thesis submission will be mandatory with the NLW harvesting the theses from the HE organisations’ own copy. Supporting the take-up for learning or research. Raise the profile of the institution’s researchers . All through collaboration, partnership and alliances. WHELF is a leader in the coperation and collaboration space and seen that way by the National Assembley and ministers. Welsh 20th C journals â€“ digitised 400k pages of welsh journals across all subject areas â€“ in welsh and in english. Had to tackle major copyright issues (not all overcome). Some did object to materials being available on the web (some are blanked out) but a very useful resource. Welsh 18th-19th Ballads â€“ Cardiff has been doing a smaller project with JISC funded â€“ about 1500 pages of ballads digitised across NLW and Cardiff University. And the NLW learnt much from this process of working together with another organisation. NLW aims to digitise the whole Wales print corpus. This will contribute to the â€œPeople’s Collectionâ€� and feeds into the National Assembly for Wales agenda. Despite this work coming under the authority of both the Culture and Heritage Minister and the Education Minister there is real agreement around the education, heritage and cultural tourism areas. NLW â€“ early starters, major player, own digital website, Culturenet Cymru (Arms Length body in Aberystwyth, People’s Collection. Peoples Collections Wales is history from the grassroots up rather than an academically driven initiative (though some academics involved).Â A very interesting development. Bilingual interface and funded by Assembley. Staff of 8. Uses pretty cutting edge digitisation methods (including commercial software involvement) and community contributions (crowd sourcing â€“ eg one academic collected memories of the first world war and digitised artefacts; anyone can add comments or metadata). The site is being pushed heavily because of it’s fit with the broader Education, Heritage and cultural tourism agendas. TV ads are running for this website with a very sophisticated advert highlighting different use cases (including mobile). University Libraries â€“ most of our institutions are not very large so what we do we do through WHELF to get things undertaken. Digital Humanities research centres being discussed â€“ Cardiff and Bristal are talking about this. In wales only Cardiff has done digitisation on a regular basis for so long. Recent profile investment TTP (Turn the Pages) â€“ digitised about 15 works to promote the rare books collections â€“ these are accessed via large touchscreens for venue and for travelling with. So looking at stats for Ann Griffiths hits â€“ a big spike thanks to TV coverage of her work. About 100k hits average for this collection and we expect similar for other projects. Links to WHELF’s digital strategy. Major mergs within Univeristy of Wales presently (being promoted by Welsh Education Minister), so libraries too. Idea is to make bigger more impactful universities and that will impact libraries. Two have recently merged and libraries and computing merged so that libraries now run by IT admin manager which has an impact too. to avoid being left behind what others are doing. Q1) Is WHELF a legal entity? What happens re: funding and lead institutions? A1) Not a legal entity. We have Memorandums of Understanding for projects and it hasn’t been a problem at all to date. Q2) Standardisation of metadata or ingest across instititions? Q3) Digitool â€“ does it provide search for resources? Can it link to others’ catalogues? A3) Not at that stage yet but we hope it ties up in that way. All but one institution in Wales uses the same Library catalogue suipplier so we don’t experience problems with cross searching etc. Q4) How would Digitool Cymru be cross searchable with NLW and Peoples Collections? A4) It wouldn’t. It would fill that niche. But it would feed into NLW’s collection of print copies (by passing on copies) and we would also feed in a small group of materials to the People’s Collection. Q5) Must be downsides too? A5) From a Cardiff perspective, other institutions look from other locations down into Cardiff. There is a phrase that goes around Anywhere But Cardiff â€“ people want to ensure they have a stake too. National Assembly, NLW and CYMAL is all in Cardiff. There is a tension but not a major problem. Curatorial Departments include Asia, fashion etc. The Word and Image Department, where Doug is based, is very wide-ranging. The National Art Library is the biggest specialist collection of art books in the country (perhaps except British Library), Printings, Drawings, Paintings and Photographs Collections (Â¾ million items), Archive of Art and Design, records of the museum itself and three reading rooms. Cue: National Art library, Prints and Drawings Study Room (was renovated when British architecture drawings joined the collection), 20th Century gallery is actually in one of the library spaces. Artists books in the National Art Library â€“ these are described in AACR2 and MARC21 even though they include globes, impenetrable books etc. The V&A Website is about to change to a very different look and feel. The current one is more information management, the new one [now in place] is more magazine-like. One of our big challenges is how to combine different collections into one place â€“ the William Morris Collection say may be archives, books and collections materials. Few years ago involved in Beyond the Silos of the LAMS: OCLC Report in 2008. Identified many areas that should be working together and talking to each other. Brought about a huge difference in the collections and how they are displayed to the project with cataloguing and digitisation work to follow. A few years ago we were quite conservative. 20-30k records. Very contained, we only published when up to a perfect standard,. A number of people felt this no longer worked in the modern world and that we should make collections and images as available as possible. We want people to use our images in classes, in Wikipedia articles, whatever. We did it with an eye on the rights side but we went out a lot further than many others had at that time. So we put the 1.2 million records up a year or two ago. Suddenly lots of records â€“ many have little there but they are available. As you’d expect you can search the collection in various ways. A search for Sheffield found lots of Sheffield silver work and you get back images as well as records â€“ ordered by quality so those with images and detail appear first. When you click on the record you get more info, can download a fairly good image to download â€“ this is where we really went out on a limb. You can use them in Academic publications (as long as less than 4.5k copies). There is small print but do look. In addition we published the API for the way the catalogue searches our server. Also works on the iPhone really well. We also deliberately made the images available to Google so they appeared in Google Image Search. Also experimenting with other ways to look at the data â€“ FABRIC Project Prototype â€“ ways to search with colour, texture or shape based on image content. Highly experimental. Key in any data that enhances records etc. Photography and cataloguing are separate but get tied together â€“youÂ don’t have to wait on the one to start the other. We have been transferring earlier published catalogue entries and updating these as needed. The older PDP Catalogue entries are being handled by four or 5 staff who key in these card entries. This work lets us exploit our infrastructure and content. The Public Catalogue Foundation create printed catalogues and are collecting information on all of the oil paintings in public collections. We provided basic images and descriptions. Records could then be further enhanced. There is also a Your Paintings (PCF/BBC) project across the UK to enhance records, and to search for unrecorded oil paintings. There has also been a National Inventory Research Project with project partners including the University of Glasgow. This is new fundamental research on top of existing records â€“ some outcomes included good quality digital records and even re-attribution of the artist behind a painting. British Printed Images to 1700 (British Museum and UCL) project is also worth noting. The V&A and British Museum provided images, for example early prints from Richard Barlow – our books included the original design for the printed image â€“so that you can compare the print and the original drawing. We also work on various printed catalogues etc. based on online catalogues. All records online are updated to reflect these printed collections. We do focus on collections of broad interest â€“ so Recording Britain Watercolours looks at the UK after the second world war and landscapes at risk of changing. We are currently working on National Photographic Record. Sir Benjamin Stone operated at the beginning of the 20th century took pictures, particularly of York or nearby, and these are being collected together. Anyone is welcome to use these images although a link back is appreciated of course. Computer Art and Technocultures was a major AHRC-funded history of digital design, art, graphic design. People think this is a new field. Started about 50 years ago and we had accumulated early exampkes of this work. So we have a collection of computer art. The AHRC funding with Birkbeck we were able to go through systematically improving records, enhancing data nad creating potted history of the medium. Most of these images are now included in Search the Collections again. We didn’t know much about some of our objects, we didn’t know the artist in some cases. We put them online nad asked people to contact them with more info and we’ve had artists etc. contact us since and very pleased to provide more information. Hope to build on this project in the future in a similar way. 2010/11 to date â€“ items audited â€“ 6146 â€“ total to date â€“ 46,102 etc. Have atarfets for catalogue records and images â€“ we are exceeding our targets at the moment. See number of records on “Search the collections” site some years ago. Huge difference between 2009 to 2011. Huge policy change behind that of course but a huge jump. Q1) What kind of resources are involved in this work? Q2) Is there a stand alone digitisation strategy? Or does this work form part of a larger group? A2) We have a digitisation plan but aso sit on a group which coordinates plans across the museum â€“ led by curational teams. Q3) Any ideas about what users are doing with collections online/ What users are interested in and what they do? A3) We get lots of stats off the website generally. Haven’t done a lot in detail with that yet. But we do try and track the images and see where they end up, look for links back to the V&A. They pop up in all sorts of good places actually. Q4) How do you trace the images? A4) One of the things you do is site searching for links. Without that it’s harder. Q5) How do you determine what to digitise with that quantity of items? A5) I am keen on just doing it systematically â€“ doing every box in a room. But in the real world you have to do particular collections, particular sets of materials etc. So that Recording Britain image I showed for instance â€“ clearly we do items where there is a known interest. Update from Alastair Dunning, JISC on Digitisation funding etc. This is a brief alert to a call for large projects. Also for CC and OER type projects. It will be 250k-750k, for around 18 months. Eligibility will definitely include England, not sure where else. The call will come out in mid april, submissions mid June. Get planning now! There will be a town meetings coming, keep an eye on the JISC-DIGITAL-CONTENT mailing list for more information. We have knitting collections â€“ cue toy rabbits from collections. Collaborating with lots of different groups, lots of different people. Patterns and knitted jugs. 19th Centurey knitting â€“ see lace collar knitted from 19th century manuals. We have lots of collections on wartime manuals and knitting patterns. We hope to work with RunCoCO on community project â€“ maybe conference in 2014 on World War Knitting. Been working with VADS on a project with Look Here! We are not at the stage of digitising lots of materials. Cue the famous poodle. The poodle has been to the Woman’s Hour studio. Even in her organisation there is a split about should you take knitting seriously or not. Bit of a revival of knitting, a now popular activity which is still going so the digitisation project is trying to help get more knitting resources out to those groups, not just academic conferences. Now looking at thematic patterns â€“ sports patterns for the Olympics. Can be very hard to find information on the patterns â€“ designers etc. Will apply to Jaeger for permission to digitise as we have a lot of their patterns. Crowdsourcing ideas â€“ people can put in own pictures and patterns. But needs to be focused â€“ I don’t want to take over from Ravelry, just want to have focused projects. Have huge collection of knits from patterns â€“ not historical items â€“ that we show and handle with students etc. Cue awesome Mary Quant pattern â€“ when we apply for copyright on this there are multiple people to check with. Had lots of donations recently and we now have to have an area for collections that have been donated from 70s, 80s, 90s. We collect every year. So we are approaching having a national knitting collection. Men & Cardigans book based on collection. Cue image of community of knitters. Playbills â€“ Helen Westmancoat etc. Project began 2007 when we gained funding for a digital repository. Have Theatre Royal archive so saw this as a means to gather playbills from across the city â€“ some painted on walls, some in private hands. Got scanning done on basic scanner at city of york, raised publicity and it was hoped that would lead to the community contributing more materials. See: Yorkshire Playbills website. ArchiveWave is repository software that can be searched and viewed â€“ you can access the description and metadata as well as image. Fascinating variety of information on these playbills â€“ and for instance first lion king production. Great for family history researchers because of the names and the costs also. During wartime you can see that they playbill printed both sides to save paper. Also cost and types of play varies. 20th Century part of the collection contains much less information â€“ by now you have programmed and so on so detail not needed. Lydia Stafford is a student under York St John’s â€œStudents as Researchersâ€� project. Currently scanning playbills and adding metadata about names on this work. Her aim is to expand the archive by adding to the collection, particularly for genealogists. Also assessing the archive as research and education resource. Future direction for project partners â€“ applying for funding, possibly Heritage Lottery funding. Green Eyed Monster â€“ play of 1830 â€“ playbill on screen â€“ includes printers as well as show details. The project wants to create a model/framework for other digital archives to use and follow. Partners are Uni of Virginia, Uni of Hull, Stanford and Yale. Traditional manuscripts â€“ message and medium are inseparable. This is very different to born digital materials â€“ both are separate and threatened with obsolescence. And in this case the copy we have are duplicates and the original are usually in use. We all use FedoraCommons which is one of the reasons we are working together. Software is a big issue â€“ versions bring incompatibilities. Out of 65 computers in our building only 2 read a floppy disc. We don’t want to become a hardware museum. Challenges â€“ how do we preserve, convert, catalogue and manage born digital materials. Depositors â€“ working with Stephen Gallagher, novelist and screenwriter. His work is only on paper when printed for actors. We have to know about his hardware and software. We also have hybrid collections â€“ we print some and provide access to digital version in parallel for some formats. Social Media â€“ huge amounts of data created and we can’t/don’t collect it all. Working with 3 transatlantic partners has been a learning process. Some problems â€“ 3 American partners have good conversation when Hull is in the evening, hard to join in. Have a secure sharing space (UvaCOLLAB) but we found Google Docs was more effective as you can edit documents and chat in parallel. Conversations have been critical â€“ we have a Skype call once a week. Huge difference in knowing each other and in progressing the project. Conclusions â€“ libraies are changing and we must act now to deal with that. See the AIMS website for more details. Digitisation in the Public Eye â€“ John Rylands University Library (Manchester), CHICC Centre for Heritage Imaging and Collection Care. We have medium format digital cameras and cradles, portable kit (so you can do all the taxidermy you like). Worked with Chethams library, Brotherton library, Manchester Metropolitan, Manchester museum, etc. Digitised Chaucers Canterbury Tales at Petworth House, Sussex. Set up (and publicly viewable) to take images of the book then processed on laptop, a second laptop showed a presentation on the project for people to come in and see. Had Digitisation Day at John Rylands Library â€“ used a facsimile of a German manuscript that demonstrated techniques. Had lots of visitors with questions, advice for caring for items, and promote th service to the public. Tatton Park, Knutsford â€“ similar idea to Petworth. Historic house that people tour. At Tatton they took out furniture and boarded up so that they had lots of space to work. Digitised pages and then put them on an iPad so people could instantly look. Got press coverage from the BBC, went out on the internet on blogs etc. When the Chaucer materials went online it crashed the system â€“ from a few hundreds to 27k. A lot of the hits came from a US website. Good idea. Some costs involved â€“ slower digitisation process and needs more staff, and the objects are somewhat less secure/safe but we monitored the onjects carefully. It really opened up awareness of the materials at the venues â€“ many of the houses are known but their libraries perhaps not. Introduced new technology to these events etc. When we started doing the days people were wondering why this would be interesting but people do like to see behind the scenes. The items are usually locked away. Projectors etc. really help raise awareness of the objects. Gave lots of advice on care for books, negatives etc. Lots of interest from the BBC â€“ were on the radio one of the mornings we were there, was on local BBC news at night. Brought more people out. Used Twitter a lot and our blog had loads of interest. Building audiences for the future through these channels. What’s interesting is that the audio visual technology they brought into venues aren’t already in use â€“ things like the iPad etc. were really engaging especially with younger visitors and perhaps give ideas for future use of that tech in those spaces in the future. What’s next â€“ want to work digital days to social media. Talking about making facsimiles for exhibits in some of the spaces. Q1) The business modelling aspect you mentioned – where did you get to? A1) An intern from Manchester Business School came and did work and surveys with partners â€“ about process of digitisation and having the library going out and about as a business. More information on this will be one of our outputs on the website. This presentation is based on material covered in this blog post by the LIFE-SHARE team. The Collaboration Continuum. Quoted here from Collaboration Contexts: Framing Local, Group and Global Solutions by Gunter Waibel. So the key thing was to make this part of the normal process of working, that there is a great White Rose way to do digitisation etc. We are: Beccy, Project Manager, and Matthew and Ned, both Project Officers. Relationships â€“ your eyes meet across a SCONUL Meeting!Â Get to know each other very informally. We’ll go through the continuum and what we’ve done and learnt. Lifeshare project came into context of the White Rose consortium which already existed and was already a relationship and connection between libraries. There are already shared services â€“ White Rose Research Online and eTheses. Already some joint projects, a project on collaborative collection management which took place with the BL. You can email, which is great. Telephone is immediate but not always perfect. If you just go in for a one-off workshop on collaboration you can say what you like. If you have another meeting booked you actually have to have realistic aims and come through on them. Co-operation â€“ dating, no strings attached. Informal working on an activity with tangible benefits. Can be a bit unrequited or one-sided. Quite informal but you help each other out and have sharing going on. You have already been meeting regularly by this point â€“ there is an established exchange of experience. For LIFE-SHARE we had regular meetings with White Rose and also with JISC. We also had regular exchange of experience events â€“ copyright, repositories, digital course readings, digitising archive materials from Special Collections. And we have case studies with various organisations at this level. We have also had training arranged on a consortial basis at this level â€“ allowing us to bring trainers up to Yorkshire with only one set of costs for the whole consortium. Creating open environment and communication will flourish. Earlier we heard that Silos of LAMS involvement had instigated better internal cooperation even though that was an external event, we found that too with these informal settings. Co-ordination â€“ time to book the removals (what does a lesbian do on the second date…). Move beyond the ad hoc stage, starting to share calendars, committees, slightly more formal â€“ softer infrastructure is there at this stage. So we investigated in digitisation suites â€“ we invested in particular areas in particular libraries. At Sheffield did audio visual, York did large things like maps. Coordinating these purchases means 3 sets of kit cover all types of materials but that relies on trust between partners. Also digital course readings led to working group set up. Last thing is bid writing. The lifeshare bid itself was at this level. Out of this project came a bid After-Life â€“ not successful but set up a precedent for future bids. This is formalisation of the collaborative process. Needs investment in staff time, not just about grabbng piecemeal time at this level. Senior Management approval needed at this level. You need the tools that support shared working â€“ Google docs, wikis etc. all come in here. Our presenters not that this is a good quote though perhaps a bad example given the state of Welsh foodball! And then they finish with a LIFE-SHARE inspired singles ad! Q1) What is beyond convergence? A1) Well that original diagram has investment, risk, benefit on it. Perhaps after convergence risk converges and benefits still rise. I think trust should be on that diagram too. Q2) Anything on size and nature of institutions involved? Does being bigger or smaller make a difference? A2) Sometimes there is an advantage to being different, sometimes a disadvantage. We are all research libraries and we had this long established consortial bond. Each library would like to think their materials are unique. We have core elements that are the same though. We are academic organisations, we have students. I don’t think of us being unbalanced but maybe I have rose-tinted spectacles. We do always want to benefit our own institutions in the end. Q3) picking up on trust. When Peter talked about Wales he talked about sustainability. Some areas of White Rose and Life-Share â€“ if you have converged digitisation service and it falls apart you could rebuild. But some other activities, particularly digital preservation, you can’t start again from scratch if you need to. How do you cope with change? A3 – Bo) We have a memorandum of understanding and we have a ratification every year for our repository service â€“ that process itemises what would be done if something does go wrong. Seen as 3 way ownership of the data, and we have an agreeement fo what happens if any of us wants out. A3 – Another member of the project team) Digital preservation is too big a task not to cooperate. If we don’t do it together it just won’t get done. One of our external partners in Life-Share was the British Library. As an outcome of that we had some funding for another project â€“ there is a flyer for the Aqua project in your bag for that! Q4) Is there a geographical limit to the effectiveness of a consortium? Is being physically close important? A4 – Beccy) It is relatively easy for us to all meet up â€“ 45 min train journey only â€“ so that closeness was really imporant for us. A4 – Bo) The relationship metaphor is imporatnt. You need something in common. We are near each other but others may have a particular subject interest or similar that makes the difference. Q5) How important in having the right people? What is the risk associated there as well? A5) Library directors have changed through this project so there is momentum that can be kept up. But I know that the White Rose directors looked at the contiuum they asked us to look at the top end of the continuum. They are brought in already. Not the case already. We need to think about how we move people from that early contact and informal sharing stage to those later stages. We have directors on board but we need to ensure everyone on th eground gets it too â€“ that’s part of the White Rose Staff Development. 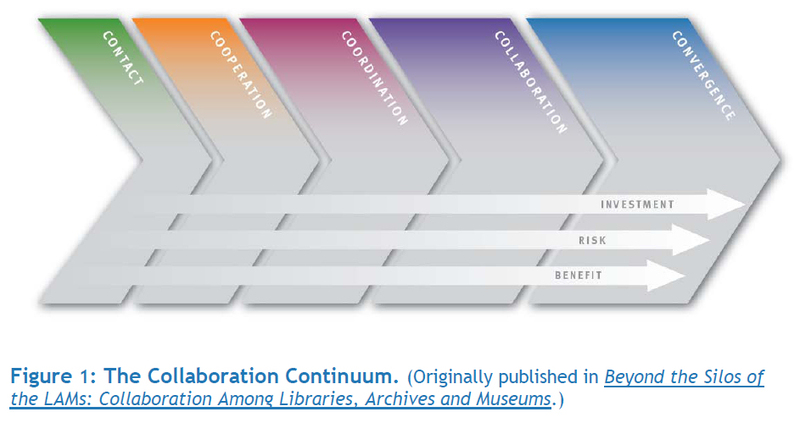 A6 â€“ Bo) we should do a collaboration continuum roadshow at each of the three universities. Question: How does the idea of having collaborative work like this work with individual priorities and distinctive in our proposal. How do you retain identity and priorities when working in collaboration? Peter: Not thrown up any serious issues of competition / conflict for us. We do work well together and in our context most projects or topics only relate to one institution strongly. Individual priorities don’t go. Collaboration is just part of that. Doug: We don’t generally find ourselves competing with people, we usually are looking for complimentary skills of experiences. Alastair: Much of the White Rose stuff is behind the scenes so may not alter public perceptions anyway. Question: In terms of feasbility studies for digitisation projects or products â€“ how can you tell there is interest or a market for that at the outset? Jodie: Don’t build then assume. Best to start with where interest is already being triggered. But you can start to do some items and your community comes to you. When looking at millions and millions of objects you need to digitise stuff that’s in need by the community, or a research unit. Etc. Doug: we conciously create images etc. knowing that people using online collections may know nothing about the wider context, they may never visit the building, they have a very different relationship. Peter: we canvas opinion ahead of all digitisation at Cardiff â€“ every time we do that we get half a dozen ideas related directly to core research or teaching aims. One example â€“ a project we digitised 10 years ago â€“ we had a call from the BBC asking if they could use a higher res version for Countryfile so we re-digitised, charged Â£10, and it’s on their website with a link back. Martin: we all want to see return on investment in research, learning or teaching. We need to have evidance that digitisation supports one of those areas. Doug: difficult though as some of the aduiences using archival content may be small but the material may be obscure and unique, you might be the only place to find that. I am keen to focus on what is unique to us, that no-one else will be able to digitise. Alastair â€“ in terms of JISC we have funded the Strategic Content Alliance and we publish case studies on how to do audience analysis â€“ we have one from the BBC around iPlayer for example. Another JISC example is the Scott Polar Ice Caps images â€“ 20k images and in their bid they listed all the groups within the university that would be interested â€“ anthropology, geography, fashion, etc. Made specific relationship between content and courses it would be embedded in. That way of thinking about breaking down the audience is really important. Need to identify really fine grained communities. Question: How do you make sure with staff in your institution that collaboration isn’t seen as doing things on the cheap or giving them more to do? Martin: well there is a sense that it is a benefit of collaboration that we do cut costs. If you look at ePrints online for White Rose there is no question that we create one better resource than could have been provided as multiple separate resources. Sometimes it’s about doing stuff cheaper, sometimes about doing things better together online. Jodie: When things do work well things want to keep growing. Can’t do business as usual, you have to make changes. Peter: From a special collections point of view if you are being successful and it is relatively inexpensive but you may be streched for staff you have your case for adding more resources using that as evidance for need and benefit of doing things. Alastair: Must be difficult to demonstrate benefits at outset â€“ can be recognised later on though. Doug: V&A have a commercial arm and they were very concerned about us losing that income stream. All the profits from that service pretty much just covered cost of checking emails, giving permissions etc. Beurocracy was expensive. But potentially you can still get income stream â€“ commercial use is a focus but non commercial use is self-managing now. You have to be aware of consequences further along the food chain. Jodie: If institutions really open to collaboration. People at bottom level can all work through common sense tasks togather. And then apologise later if needed. Martin â€“ Hate to criticise the collaboration continuum but it’s non linear. At a state near collaboration/convergence level you need to business plan. Mostly we have been at the informal stage. Needing more staff to take up a level then you need to have good business case. It is a difficult thing and it varies. Comment on commercial aspect: The National Fairground Archive has generated great income stream. Question: We envied your existing relationship. We wondered how you can create an entirely new relationship and quickly have a strong collaborative bid? Jodie: It’s not one easy solution. A good conversation might lead to a working partnership a few eyears later. Doug: Don’t happen overnight. Have lots of partnerships in the UK and abroad. V&A staff spend a lot of time talking to institutions, some of us have academic links to institutions around the country, we already know some of the people we’d want to work with. Peter: We’ve been building relationships with Bristol later around a centre fir Digital Humanities research centre. On the wider issue one of the staff at NLS are reassessing all alliances and links to see which ones are of real benefit in the short and the long term in the current financial climate. You may need long term relationships and some shot gun weddings. Martin: There are risks in Multiple Collaboration Syndrome â€“ sharing interests with various overlapping groups and consortiums. Choosing collaborations are relaly important and you have to stay focused. Alastair: For that specific question on JISC digitisation monies. You will know researchers, institutions etc. yOu will have connections in place even if they aren’t formal relationships. You can also ask out about possible collaboration and people coming forward. Jodie: have to advertise in the right place to â€“ would be great to have a collection audit to draw upon when funding comes around. Alastair: JISC funded a project called DiSCmap that aimed to list the UK’s special collections. Question: We’ve learned about what to learn form positive experiences, how do we learn from mistakes â€“ are there ptfalls to avoid? Alastair: Having too many partners can be a problem â€“ what do you want out of the partnership and what do they want? You need to be clear what you want throughout. Jodie: I’ve been in partnerships where someone leaves at the last minute. Or where one partner does most of the work, but the other holds most of the funds. Particularly tricky when budgets get tight. Peter: You also have to make sure all partners deliver. This comes down to trust and how you manage that relationship. Questioner: Having the person you know you can work with at an institution can be the distinction between a functioning partnership and one that that doesn’t. Even one enthusiastic person can make all the difference even if not senior staff. Bo: Problems in Lifeshare project came down to the fact that senior staff can be brought in but not every member of staff can be assured to be convinced of the value to them. Comment: Leeds and York teams are small, Sheffield is very large. Her staff at Sheffield are concerned that if cuts come they would be at risk â€“ sort of issues on the ground that undermine trust in partner working. It is concerning especially in the current climate. Comment: One of the concerns is that defining what you are trying to do. Your ideas tend to evolve as the project develops and goes along. Very easy to become derailed â€“ one of our case studies moved from a practical project to a much more theoretical project. That definition can be a difficult point. If you have a good relationship you can manage that process much more easily. Can go back to first principles and look at interests in the institution. Question: With more and more partnership working will there be a standard for digital imaging? Jodie: There already are for some communities but would hope these would be more unified and international. Peter: Probably not quite. It’s horses for courses â€“ some students want thumbnails in a powerpoint file, others want a major high res Tiff (e.g. BBC). Alastair: Some digital projects combining content still have their own institutional needs. Can get high level agreements but maybe not enforce the format. Jodie: Becomes about guidelines then â€“ especially for community generated content. Doug: We aren’t the first generation to do this stuff of course, we just change specs. Martin: The great thing about standards is that there are so many to choose from. For people dipping toe in the problem of standards is that they can become a reason for not doing things. Alastair: Important to support and convert data and metadata â€“ everone can use their own stuff but you can find your way through all of it (like Google). Question: Does this sort of working benefit smaller libraries and institutions, can you bring them into partnerships? How do you work with smaller partners like museums? Peter: think small institutions in Wales are so keen on WHELF as smaller institutions benefit more greatly, though larger institutions are seen as leading for taking part in these projects. Doug: we do small scale digitisation for partners where we want access to content â€“ for instance for items that build the history of the V&A itself. Don’t do it on a commercial basis. We have a good relationship with RIBA. We have some very specialist equipment housed with us and they can use it. Jodie: can see that as we build business cases â€“ internal digitisation can be done but external digitisation may also be useful. Maybe bartering of expertise or similar could be traded for use of equipment / digitisation skills. Question: Don’t suppose there is anything new in collaboration but what is unique or new about collaboration around digital activities? Alastair: New challenges but also new technologies for communications. Maybe some new twists though. Peter:Â Need capacity to start. Smaller institutions aren’t in the game, you have to have capacity to be in the game. Alastair: Other aspect is that you can have global collaboration â€“ and if universities are looking at securing or increasing international students that is more important. Question: How do we evaluate and measure relationships and present that? And how do we provide ourselves with a business case for more digitisation? How do we form that? Peter: WHELF â€“ where would we be without collaboration â€“ easy to measure by where we would be without collaboration â€“ a much worse situation. Martin: Difficult area. Contingent valuation approach can be a useful way to measure what we’d want. I’d pay 50k for a repository say, it’s worth having there and we get a better service that way. That sort of approach is how we deal with other partners like the NHS. But we need some sort of value to compare scenarios. Alastair: How about the Manchester example? Comment from Manchester staff: We haven’t seen the business case yet but different staffing proposals (and we already have the kit). Alastair: JISC’s point of view is about thinking about digitisation and how it fits within your organisation. How does it fit in the workflow of teaching and research staff. How does it benefit the university? Metrics for that are increadibly difficult. Martin: To disagree with myself â€“ actually it’s all very well to measure stuff but sometimes benefits are very long term indeed. The Fairground Archive â€“ when we started to digitise that it wasn’t automatically clear what the benefits would be but 10 or 15 years later it’s proved to be a pretty crucial resource. Comment from Manchester staff: It has evolved. Business models have changed over time. Building a structure that will benefit broadly. At this point Brian Clifford, University of Leeds took over as chair since Alastair Dunning had to leave early. Question â€“ The primary source being digitsed, secondary research being carried out on that data. Then talk about curating digital content â€“ a lot of social media is ephemeral how do we collect and tie that to the original sources. Doug: We are using crowdsourcing at the moment, some more public than others. One was to do with cropping images. Someone in our online museum section suggested crowdsourcing cropping of images â€“ flagged as crowdsourced and not overwritten. Similarly people could add notes and thoughts to our own objects. Don’t want that data to be cluttered â€“ so you have to manage that appropriately. Jodie: Have a few collections we want to crowdsource so looking out at other examples. Comment from Manchester staff: Thinking about using flickr for some crowdsourcing. Comment: Looking at Transcribe Bentham there are 8 regulars out of hundreds of users. Realigning expectations of crowdsourcing. Not just output but community built. Comment: Other useful examples here include the work the National Library of Australia have done with digitised newspapers and the work the National Library of Scotland have done via Flickr. Comment from Manchester Staff: Who will moderate this material? Comment from representative from the National Fairground Archives: We’ve done some mocked up surveys on fairground bulletin boards on habits. Less care taken over digital images. When 35mm was in use you are careful anout taking pics, but now people will throw tons of materials online but how do you curate that material? Need to look at it now. We don’t really have “quality” listed in our collections policy â€“ how do we add or deal with that? I follow threads on discussion forums. If this was unleashed on our online space there would be lots of moderation. Need to differentiate between good quality information and everything else. We have diaries from the 1950s but in the future that inormation will be on blogs and messageboards. Comment: Would’t disagree but strategically we have to engage with this material. What struck me about Peter’s presentation on WHELF what struck me was that the govnerment are happy to put money in that sense of Welshness. Strategically as curators of information we have to engage with identity as that matters to people. Many of us are from HE perspective. Other part of that is that future material for future history is arriving. How we do it â€“ no clear answers. Comment: Napier University have been using mystery objects of the day for unknown items in their printing archive. The Library of Congress is preserving, there is commercial tracking of comments for product mentions and that will also surface useful techniques. Peter: That’s leaving it to commerce! Comment: No the LC work is important, the NLS Flickr work reuses user data. Twapperkeeper has been locked out of accessing and archiving tweets for download (as it once did). Commercial monitoring can help us find the right methodology here.